For nearly ten consecutive days the biggest story in the biggest city on the planet involved the most celebrated and popular sports franchise in the world, the New York Yankees, and their long-time manager, Joe Torre. Would he stay or would he go? Fired? Retired? Retained? Replaced? It went on for long days of nationwide speculation, dwarfing what is left of baseball’s snooze-fest post season. Everyone weighed in from politicians to celebrities to figures from every sport: Great or overrated? Irreplaceable or a product of talent and payroll? Focal point of success or recipient of it? Torre eventually decided to go, turning down the Yankees’ low-ball offer after his team, with the biggest stars and the largest payroll in the game, was bounced from the first round of the play-offs for a third consecutive year. I say lowball with tongue jammed firmly in cheek since the Yankees insanely paid Torre $7 million a year for the previous three when the next highest paid manager was getting 3.5 mil, and then after that good luck if you get one mil. Then again, this is the big bad New York Yankees, richest, most famous team with the richest most famous players. When they play home they are the toast of the town, the hottest ticket and the best story. When they go on the road it is the Rolling Stones, as teams averaging just around 20,000 a game watch their attendance nearly triple. They have their own television network, posh Manhattan stores, and scouting battalions in countries all over the globe. So maybe the Yankees never needed Joe Torre, despite the fact that only two teams owning the top 10 payrolls over his 12-year tenor, the Boston Red Sox and Chicago White Sox, have won a title, with the exception, of course, of Torre’s Yankees. But before Joe Torre managed the Yankees he was a mediocre skipper with mostly mediocre records for three different franchises. Despite being a baseball lifer and a damned good player, Torre had gone decades in all kinds of jobs without ever participating in a World Series, while the Yankees pretty much invented the thing. Now, after reaching the Fall Classic half the time he was here, Torre has become the wealthiest man to ever manage baseball, a shoo-in Hall Of Famer, and a beloved New York icon with nationwide respect. Recently a Newsweek poll listed him number two behind Michael Jordan as the sports figure most capable to be president of the United States. Maybe Torre just had good timing and fit the mold, much like another successful Yankees manager, Casey Stengel, who also went from mediocre to Hall of Famer by donning the pinstripes. But then maybe in an age of wild free agency, revenue sharing, luxury tax, three-tier play-off series, and increased competitiveness (no World Series Champion since Torre’s 2000 club has even won a post season game the following year, much less repeated) there is something remarkable about this guy. Simply put, for the 12 years Joe Torre held sway over the Yankees fortunes, no one in any business or holding any position of authority anywhere had a better run. And don’t give me Bill Gates after that Vista disaster. While presidents were lying under oath and presiding over an attack on our soil and then feeding us into Middle Eastern meat grinders, and doomed Fortune 500 companies were being run into financial oblivion by carney grifters, Joe Torre was presiding over an unprecedented streak of success, as the product he helmed soared into one of the most lucrative and unstoppable cash machines known to modern capitalism. There has never been a better stretch of dominance in my lifetime, not in New York sports, and I dare say the likes of which will never be repeated. 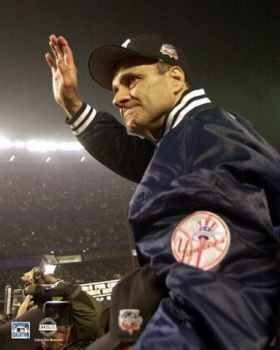 Since the day Torre took command of the Yankees, who at that time had not won a division title in 15 seasons or a World Series for 18 – the longest such stretch for a franchise with 26 titles – the team reached the play-offs each season. Of those 12 winning campaigns Torre compiled 10 Division titles, including nine consecutive, six American League pennants, and four World Championships, including a three-peat from 1998 to 2000. From 1996 through 2001 the Yankees won a ridiculous 54 post season games and lost only 19, including going 22-3 in ’98 and ’99, capping off the last decade of a century in which the franchise ended up winning a quarter of the World Series played. In 2000 the team won the first Subway Series in a generation and in 1998 posted an astounding 125-50 a record that will doubtless stand the test of time as the greatest ever. Not bad, right? Hold on a second. When Torre showed up in 1996 the Yankees had hired 13 different managers over a 23 year period, some of them twice and the famously soused Billy Martin five times. Most of those men were canned by loose-cannon owner, George Steinbrenner after mere weeks on the job. Torre lasted 12 seasons. Despite decades of unrivaled success with some of the most legendary names to ever play the sport, by ’96 the team had never drawn three million fans during a season. The last eight seasons the Yankees have lead the entire league in attendance averaging well over three million and the last two well over four million. And in the spring of 1996, Derek Jeter and Mariano Rivera were highly prized prospects, which meant they were likely to languish in the minors behind high-priced has-beens before being traded for more over-priced dead weight. Now they are both multi-millionaires going to the Hall Of Fame possessing nearly half the post-season records worthy of owning. But this is New York and these are the Yankees, and the glory days always seem so far away. The team still wins and occasionally challenges for a title, but there has not been one in seven years, and that apparently is enough to lose the most cherished on-field general gig in a city where the other head coaches and managers have had a much tougher decade. In fact, no other New York team has won a championship since Torre hit town. In the end though, beyond the winning and money, for the past 12 years the Yankees achieved a level of admiration never reached before. Maybe in the past they were respected and feared and envied and definitely hated, but during the Torre Era the franchise became a brand again, a symbol of professionalism and grandeur, mystique and class, in victory and defeat. Beyond those who will always just hate the Yanks for being the Yanks, the previous smugness, rancor, condescension, and occasional turmoil of the Yankees turned almost lovably corporate, if there is such an animal. So in the end both team and manager needed each other, because neither is likely to see this kind of crazy winning and cash windfall again. Thus, the end of an era.